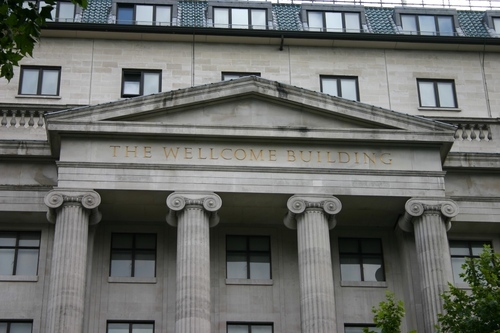 The Wellcome Building in London (183 Euston Road) was designed by the architect Septimus Warwick and "was constructed in 1931-32 to house the noncommercial research activities - scientific and historical - supported by the American-born pharmaceutical manufacturer Sir Henry Wellcome"1. 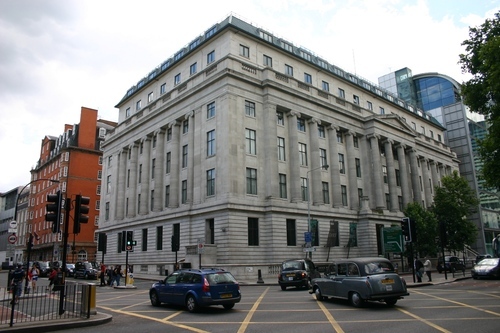 The foundation stone of the building can still be seen in the basement, at the corner of Euston Road and Gordon Street. 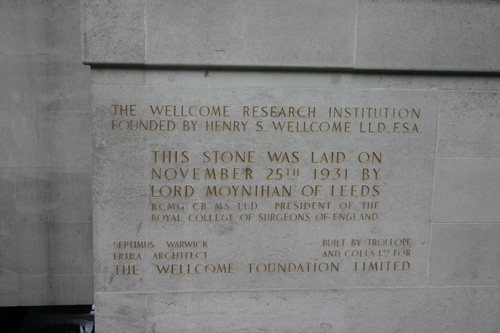 It was laid on the 25th November 1931, by Lord Moyniham of Leeds, then President of the Royal Society of Surgeons of England. 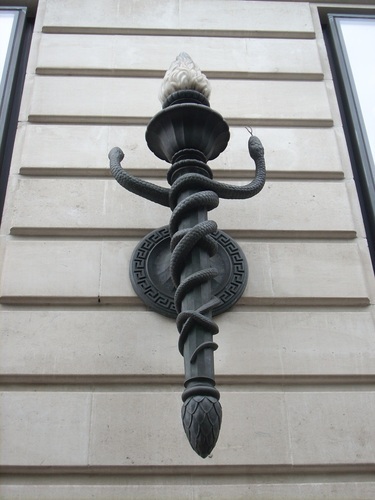 "Its Portland stone facade includes Ionic columns, altars fringed with lions' heads, and bronze torchères wreathed with pairs of snakes (a symbol of hermetic arts, alchemy and pharmacy). Over the entrance is a gilt bronze sculpture of the eagle-eye of the Egyptian god Horus, linked by the sun's rays to a hand clasping the ankh, the symbol of life"2. "Inside, Wellcome included only three areas of equal grandeur: the marble entrance hall (originally much longer), the marble stairwell, and a majestic double-height room on the second floor, originally a gallery for sculpture and the now the Wellcome Library reading room"3. Since its construction in 1932, the building has undergone many structural and functional changes. Now it is called the "Wellcome Collection" and hosts, among many other things, the Wellcome Library, two permanent galleries - the Medicine Man and the Medicine Now - and an adaptable space on the ground floor for temporary exhibitions. 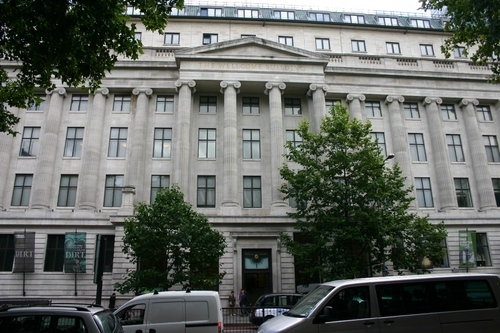 Lately, the Wellcome Trust moved to new premises of the next door Gibbs Building (215 Euston Road). More informations on the Wellcome Collection's official website. - The Wellcome Building. 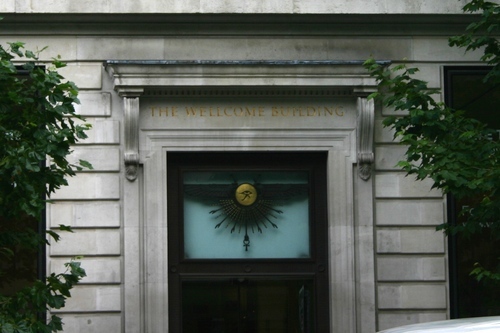 Headquarters of the Wellcome Trust and home of the Wellcome Library, The Wellcome Trust, London 2001, pp. 25. 1. The Wellcome Building 2001, p. 1. 2. The Wellcome Building 2001, p. 1. 3. The Wellcome Building 2001, p. 5.